The Prerunner features soft compound tires mounted tough racing rims. The aggressive tread pattern not only looks tough but provides plenty of grip for just about any type of terrain from gravel and dirt to wet or dry pavement. 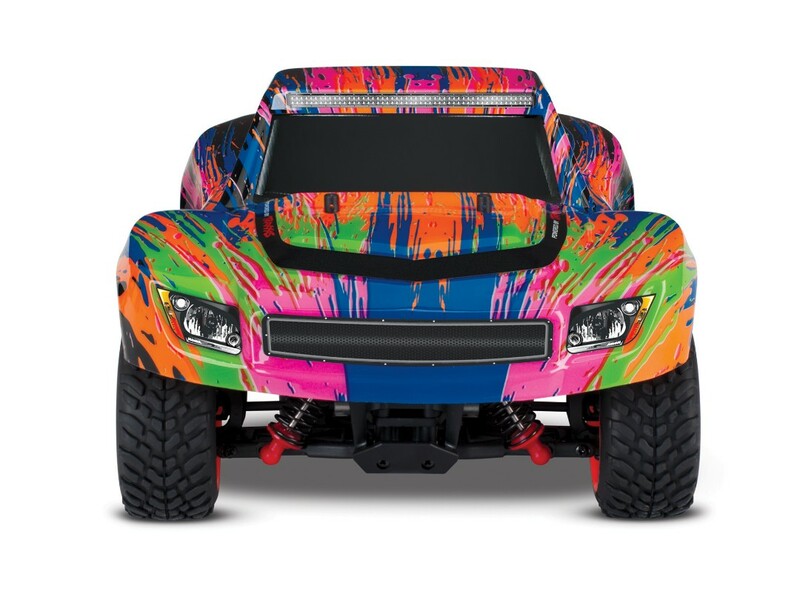 The Prerunner comes fully painted, trimmed, and decaled for good looks right out of the box. The race-ready body is wrapped with stunning custom graphics. The LaTrax Prerunner features front and rear bumpers behind the body shell to provide support and absorb impacts. Prerunner’s steep front and rear approach angles allow it to drive up ramps and over curbs. The Prerunner includes an iD-equipped 7.2v NiMH battery and convenient AC wall charger. 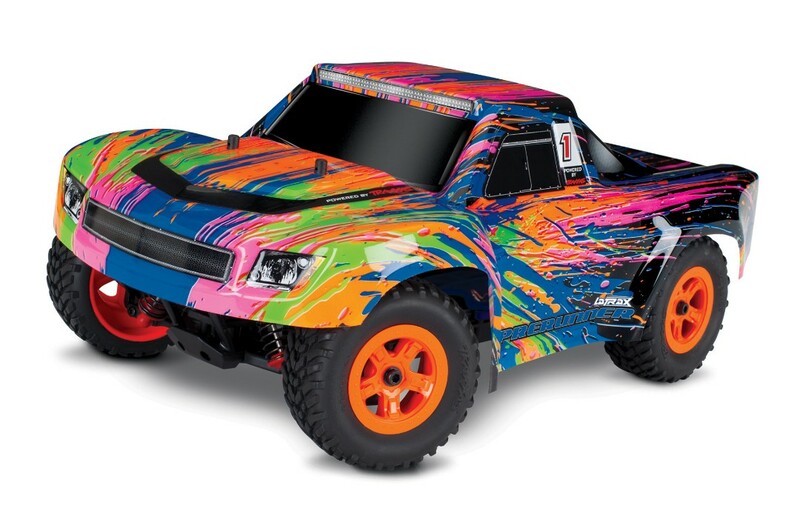 This potent pack features heavy-duty construction, 16-gauge wires and Traxxas’ exclusive patented High-Current Connector for efficient power transfer, run after run. Everything you need is in the box, even 4 AA alkaline batteries! Accessory iDchargers (soldseparately) auto-detect LaTrax/Traxxas iD-equipped batteries and automatically set and optimize charge settings for unmatched charging safety and simplicity. Four-wheel drive provides maximum traction and control on a wide range of off-road driving surfaces. An aluminum center driveshaft carries the power to the front and rear differentials. The Prerunner’s adjustable oil-filled shocks with variable mounting positions provide super-smooth performance and handling. Suspension motions are damped for smooth performance over extremely rough surfaces and controlled landings over large jumps. Bellcrank steering combined with the fully independent front suspension optimizes the steering response and precision. Stability and control are made rock solid as the bellcrank geometry eliminates « bump steer » that would otherwise take you off course as the suspension is compressed. The bellcrank steering system uses a « servo saver » to protect the servo gears from impacts. Experience 4WD excitement year-round, no matter what the elements have to offer, with the Prerunner’s patented all-weather electronics! Water, mud, and snow won’t slow you down. The electronic speed control, receiver box, and high-torque digital steering servo are all waterproof to keep the racing action running in wet conditions that send other trucks back to the workbench. Small but powerful, the Prerunner’s servo cranks out 32 oz-in. of tire-turning torque for responsive steering and precise control. Waterproof, O-ring-sealed construction locks out moisture, dirt, and debris.